The German East Asia Squadron (Ger Kreuzergeschwader or Ostasiengeschwader) was an Imperial German Navy cruiser squadron which operated mainly in the Pacific Ocean between the mid-1890s and 1914. It was Germany's only major "blue water" or overseas naval formation independent of home ports in Germany. The Treaty of Peking of September 1861 between the Kingdom of Prussia and China allowed Prussian warships to operate in Chinese waters. As East Asia grew in economic and political importance to the recently united Germany, in 1881 a flying squadron was formed for the area under the command of a flag officer. Since African colonies were then seen as of greater value, an African Cruiser Squadron was established in 1885 with permanent status, and shortly thereafter the Imperial German Navy reduced the East Asia presence to two small gunboats. From 1888 to 1892, Leipzig was flagship of the German East Asia Squadron, initially under vice-admiral Karl August Deinhardt, appointed July 14th when the ship was in Aden and took command of the ship at Zanaibar on August 2nd, and of the squadron August 31st at Manda-Bay (Kenya). The planned voyage to the South Sea was cancelled with the first signs of troubles in East Africa. As such she took part in the suppression of the Abushiri Revolt in German East Africa. On 8 May 1889 a landing party from the ship also took part in the storming of the Buschiri lager near Bagamojo. Another landing party from the ship took part in the capture of Pangani on 8 July 1889. After the end of the uprising, the ship put into Cape Town for an overhaul (August/September). In early September Deinhardt received a telegram from Emperor Wilhelm II to report to his ship in the eastern Mediterranean. The ship entered the Mediterranean on October 28 and joined the training squadron off the island of Mitilini on November 1st. The emperor meet Deinhardt on November 6th, who was returning from Constantinople, honored the members of the East-African cruiser squadron with a special cabinet order. All the German vessels left for Italy and docked at Venice on November 12th to continue repairs interrupted at Cape Town. After December 15th they departed for Malta waters then headed to Port Said where Christmas and New Years was spent. Sailing solo, Leipzig set out for the Far East on January 27th (1890) with SMS Carola, SMS Schwalbe, and SMS Sperber returned to East Africa, traveling only with gunboats Iltis and Wolf. The squadron's new commander rear admiral Victor Valois assumed command on March 16th. This was a routine period, including visits to Kotchin in India (March 20th), traveled to Chinese and Japanese ports where Admiral Vallois meet-up with his flagship at Nagasaki, From there they traveled to Hong Kong, and Manila to Singapore where they meet up with SMS Sophie. They subsequently traveled in July through Indonesia, the Strait of Dampier, the Bismarck Archipelago, then to Newcastle, Sydney (September 15th) and Jervis Bay in Australia. They were joined by SMS Alexandrine in Australia and after repairs to the Leipzig from damage that occurred in the Suez Canal, they traveled on to Samoa and New Zealand (November), and at the start of 1891 some visits to Hong Kong (February 14th) and Chinese ports in March, running aground at Wusung-Road before its visit to Nanking. In May 1891, at Jokohama, Valois was ordered to protect German interests in Chile against the Chilean Civil War. She ran out of coal on the way there and had to be towed for 97 hours. After stopping briefly in San Francisco, she traveled to Valparaiso arriving on July 9th. They traveled on to Iquique and Coquimbo during July and August. As the war came to a head, they returned to Valparaiso on August 20th and Leipzig and the British corvette HMS Champion sent a joint landing party to Valparaíso to protect the British and German quarters of the city. At the end of the Civil War, Leipzig visited various South American ports and then Cape Town. In March 1892 she anchored in Delagoa Bay, from which the Cruiser Squadron's new commander Friedrich von Pawelsz led a delegation to Paul Kruger, the new president of the Boer Republic of Transvaal. The African Cruiser Squadron itself returned to Germany for deactivation at Kiel in 1893. With the outbreak of the First Sino-Japanese War in 1894, Germany revived her interest in China. With full support from Kaiser Wilhelm II, the German admiralty created an East Asia Cruiser Division (Kreuzerdivision in Ostasien) with the modern light cruiser SMS Irene and three aging small ships under the command of Rear Admiral Paul Hoffmann. "His orders directed him to protect German interests and to examine possible sites for a German base in China." Hoffmann found his ships lacking for the job and petitioned the admiralty for replacements for the three aging ships. His request was granted and the armored frigate SMS Kaiser, the light cruiser SMS Prinzess Wilhelm and the small cruiser SMS Cormoran were sent. But without a base, Hoffmann depended on the British at Hong Kong, the Chinese at Shanghai and the Japanese at Nagasaki for technical and logistical support of his ships. Wilhelm II, his chancellor, foreign minister and the naval secretary all saw the need for a base in East Asia; the German ambassador to China complained "... our ships cannot swim about here forever like homeless waifs." Rear Admiral Alfred von Tirpitz replaced Hoffmann in June 1896 with orders to find a site for a base and to evaluate four potential locales on the Chinese coast. 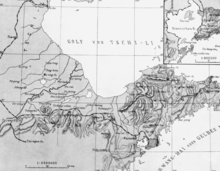 Although Tirpitz favored the bay at Kiautschou, others in the government advocated for other sites, even Tirpitz wavered on his commitment in his final report. Tirpitz was recalled by Wilhelm II, and after he returned to Berlin he lost interest in East Asia: he was now developing a battle fleet. Rear Admiral Otto von Diederichs succeeded Tirpitz as commander of the Cruiser Division. Although the navy had not yet committed to a specific site for a base due to high-level indecision, Diederichs asserted "Kiautschou alone is the goal of my efforts." German offers to buy the site were refused, but the murder of two German missionaries on 1 November 1897 provided the casus for Rear Admiral Otto von Diederichs to land troops on 14 November 1897. The imperial navy had a rather tenuous hold on Kiautschou until the region was reinforced by the arrival of the protected cruiser SMS Kaiserin Augusta and in January 1898 the marines of the Seebataillon disembarked to form the garrison for Tsingtao. With the convention at Peking on 6 March 1898, the German ambassador and Chinese viceroy signed a 99-year lease for Kiautschou and colonization of the territory began in earnest. A naval base with a supporting, neighboring infrastructure (including the Tsingtao brewery) was then built at the impoverished fishing village of Tsingtao (now Qingdao) to create the Ostasiatische Station [East Asian Station] of the Imperial Navy. Von Diederichs was recalled to Berlin in 1899 to serve as chief of the admiralty staff; he was succeeded at Tsingtao by Rear Admiral Prince Heinrich of Prussia. A series of other commanders of the East Asia Cruiser Squadron followed: Rear Admirals Curt von Prittwitz, Felix von Bendemann, Alfred Breusing, Carl Coerper, Friedrich von Ingenohl, Erich Gühler, Günther von Krosigk, and the fleet's last commanding officer Count Maximilian von Spee. In these years a broad replacement and upgrade program provided for the assignment of modern ships to Tsingtao. SMS Gefion (right) off the China coast at German-occupied Jiaozhou Bay concession. The armoured frigate SMS Deutschland is on the left. From February 1900 until 1902 Admiral Felix von Bendemann commanded the East Asia Squadron (Ostasiengeschwader) from his flagships SMS Irene, and then SMS Hertha. When Bendemann took command of the East Asia Squadron, he found it unprepared for the challenges presented by the brewing Boxer Rebellion. He actually had to borrow charts from the Russians and maps from the British in order to operate in the Yellow Sea. Nevertheless, he forcefully advanced the idea of taking the Taku Forts and the ships under his command were able to make a noteworthy contribution in the Battle of Taku Forts (1900). On 8 June 1900 he brought the large cruisers SMS Hansa, SMS Hertha and the small cruisers SMS Gefion and SMS Irene before the Taku Fort (together with warships of other nations) to land detachments of marines (Seebatallione) for the protection of their citizens in Tientsin. Lieutenant Otto Weniger, the commander of SMS Gefion then became commander of a landing corps of 500 marines, which took part in the failed Seymour Relief Expedition for the relief of the Peking delegations later in June. At the outbreak of World War I in August 1914, von Spee found himself both outnumbered and outgunned by Allied navies in the region. He was especially wary of the Imperial Japanese Navy and the Royal Australian Navy — in fact he described the latter's flagship, the battlecruiser HMAS Australia as being superior to his entire force by itself. “ I am quite homeless. I cannot reach Germany. We possess no other secure harbour. I must plough the seas of the world doing as much mischief as I can, until my ammunition is exhausted, or a foe far superior in power succeeds in catching me. The initial successes by Emden led to von Spee allowing her captain, von Muller, to take his ship on a lone commerce raiding campaign in the Indian Ocean, while the remainder of the squadron would head towards the eastern Pacific and the South American coast, where there were neutral countries with pro-German sympathies (notably Chile) where von Spee could potentially obtain supplies. Emden disrupted trade throughout the Indian Ocean, intercepting 29 ships and sinking those belonging to Britain or its allies. At the Battle of Penang she sank the Russian protected cruiser Zhemchug and the French destroyer Mousquet, catching the Russian ship by surprise while in harbour. At Madras she destroyed oil storage facilities through shelling. The ship finally met its end on 9 November 1914 after a prolonged struggle with HMAS Sydney at the Battle of Cocos. The Battle of the Falkland Islands was a crushing defeat for the East Asia Squadron. At the outbreak of World War I, nearly all the ships of the East Asia Station were dispersed at various island colonies on routine missions; the armored cruisers Scharnhorst and Gneisenau were at anchor at Ponape in the Carolines. The fleet then rendezvoused at Pagan Island in the northern Marianas – the commanders planning the logistics of their long journey to Germany, with the ships coaling. The light cruiser Nürnberg was dispatched to Honolulu in the United States Territory of Hawaii to gather war news since all German undersea cables through British controlled areas were cut. Admiral von Spee headed for German Samoa with Scharnhorst and Gneisenau, then east, conducting the Bombardment of Papeete in French Polynesia. The East Asia Squadron coaled at Easter Island from colliers that had been on station throughout the Pacific. The light cruiser SMS Geier, which had failed to rendezvous at Pagan, tried to join Spee's squadron until forced to intern itself at Hawaii on 17 October 1914 due to mechanical breakdowns. Realizing that Allied activity in the Pacific had increased to such a level that he was vastly outnumbered and losing the element of surprise, Admiral von Spee decided to move his fleet around Cape Horn into the Atlantic and force his way north in an effort to reach Germany. The main body of the squadron engaged the British West Indies Squadron on 1 November 1914 at the Battle of Coronel, sinking two British cruisers, HMS Good Hope and HMS Monmouth. It was while attempting to return home via the Atlantic that most of the squadron was destroyed on 8 December 1914 in the Battle of the Falkland Islands by a superior British force of battlecruisers and cruisers. SMS Dresden and a few auxiliary vessels escaped destruction and fled back to the Pacific, where the auxiliaries were interned at Chilean ports and Dresden was scuttled at the Battle of Mas a Tierra. The four small gunboats Iltis, Jaguar, Tiger, Luchs and the torpedo boat S-90 of the East Asia Squadron that had been left at Tsingtao were scuttled by their crews just prior to the capture of the base by Japan in November 1914, during the Siege of Tsingtao. Four small river gunboats and some two dozen merchantmen and small vessels evaded Allied capture in inland waters of China until 1917, when China seized most of them save for two river gunboats, which were destroyed by their crews. ^ Gottschall, By Order of the Kaiser, p. 134. Kingdom of Prussia was not included in the party members of the Treaty of Peking, though British royal and German peer families were relative by marriage then. ^ The origins of the Boxer War: a multinational study by Lanxin Xiang; Routledge, 2003, 382 pages, p. 282. Wikimedia Commons has media related to German East Asia Squadron. Gottschall, Terrell D. (2003). By Order of the Kaiser, Otto von Diederichs and the Rise of the Imperial German Navy 1865–1902. Annapolis: Naval Institute Press. ISBN 1-55750-309-5. Marder, Arthur (1961–1970). From the Dreadnought to Scapa Flow (5 Vols). London: Oxford University Press. Massie, Robert (2004). Castles of Steel: Britain, Germany and the winning of the Great War. London: Jonathan Cape. ISBN 0-224-04092-8. Bennett, Geoffrey (2006). The Pepper Trader: True Tales of the German East Asia Squadron and the Man Who Cast Them in Stone. Jakarta: PT Equinox Publishing. ISBN 979-3780-26-6. Friedrich Carl Peetz Photograph Album (1900), Duke University Libraries Digital Collections – includes photographs of the German East Asia Squadron during the Boxer Rebellion. This page was last edited on 16 February 2019, at 09:51 (UTC).